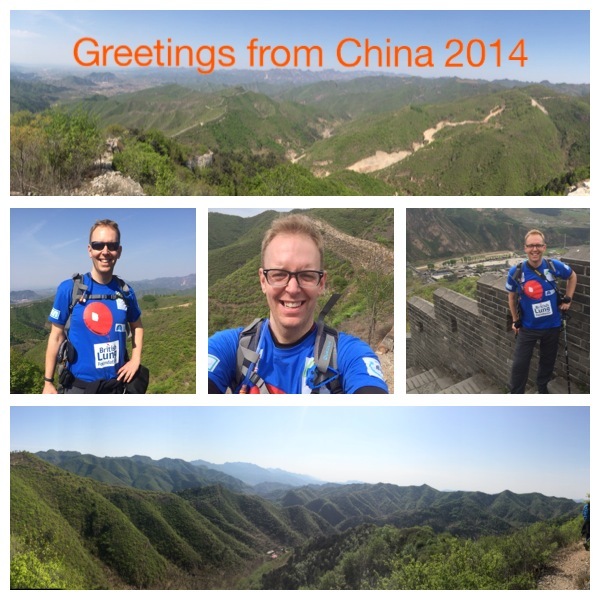 Stretching to 6,000 km in a snaking line across China, the Great Wall was begun in the 5th century BC. As it meanders across the mountains it conjures up a sense of history that is difficult to grasp until you have had the opportunity to experience it. As I set off on my great China Trek I received the warning that it would be on ‘varied terrain’. 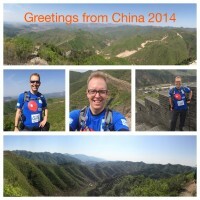 So I was expecting to trek through woodland and terraced farmland following the contours of the beautiful hills and mountains in remote areas north of Beijing, as seen in the images on Google. 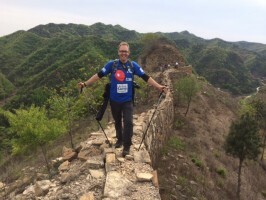 I also looked forward to trekking some of the oldest sections of the Great Wall, as well as some restored sections with smooth flagstones and lots of steps. ‘Had I practised enough’ was the unanswered question. I knew the challenge was going to be physically demanding but I hoped it would offer the fabulous scenery and a fascinating insight into the rich culture and history of China whilst raising money for the British Lung Foundation to support the incredible work they do. So off I went! Well, after months of planning, walking and painful blisters, I set off from home en route to London Heathrow to meet my fellow companions. We arrived after a good flight and a few hours’ sleep into a somewhat silent airport. Not a word, just people going about their daily jobs. However, this soon changed when we met the hustle and bustle of the hazy streets and motorways of Beijing, home apparently to 20 million people and the six million cars that line the streets. It's a warm day, but no sun, just a visible bright light trying so desperately to break through the clouds. We stopped for lunch and lots of Chinese dishes full of flavour and colour; but for some a first challenge: managing to use the chopsticks! The second challenge, actually I won't mention, the toilet stop...! After lunch we headed off and as we came near to the Forbidden City we could smell the air. It's difficult to describe but as we got closer we passed many locals and tourists wearing face masks. I try to imagine that if you were someone who suffered from COPD or even asthma how the air and the climate could affect your breathing. I could imagine many stopping on the steps, catching their breath. We passed through the temples with only time for a quick #Chinaselfie then we turned towards our pick-up for the hotel and Great Wall briefing later on. Finally it was heads down and time for sleep. After a good night’s sleep and breakfast we set off through the busy streets of Beijing, driving northwest into the hills above Huangyaguan, a small town situated in a beautiful valley in the heart of the Yanshan Mountains. After a scenic drive through a landscape of hills and lakes, we arrived at our village and beheld the Great Wall for the first time, snaking along the ridgeline of the mountains. We stopped for a good traditional lunch and then started our trek at last. The Wall was well renovated at this point, and disappeared into the horizon in both directions. 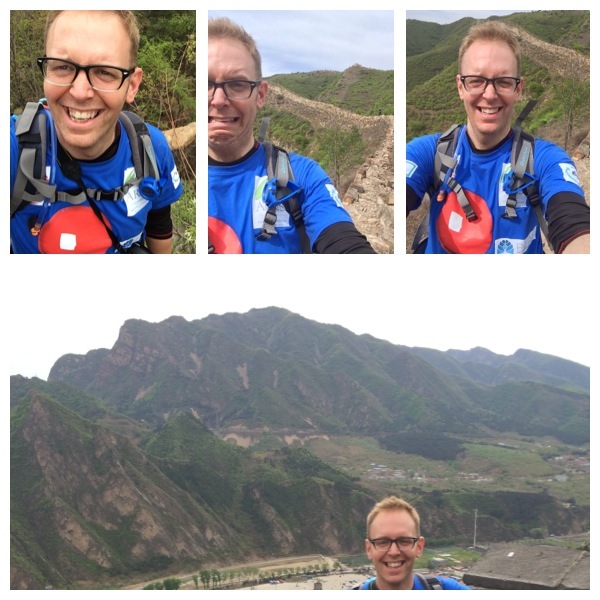 After some steep step sections, which gave us a good inkling of what lay ahead, we walked predominantly downhill until Huangyaguan. Here the wall crossed the road that led to our nearby accommodation which was basic, but had a flushable toilet and was clean. Just as the sun went down so did the temperature. After a good dinner we sat around a camp fire. It was the first real time as a group we had time to talk and laugh and guess one another’s jobs. As I tried to settle down for the night’s sleep I had to add another pair of socks as it was cold in the room, very cold and no heating either. It was a long night. After some rice and bread for breakfast, our day’s walk started again where we left the Wall on Day 1. We headed up the steep renovated steps towards what appeared to be a sheer cliff face. It was a challenging climb over uneven stone, some very high and crumbling away underfoot. We stopped, and this is where we encountered the famous ‘Heaven’s Ladder’, a very steep climb of well over 200 steps leading us up the cliff face. It was a real challenge - it reminded us all of why we were there, and the amazing sponsorship that each of us had collected for charity. We got a final boost as there were fabulous views from the top. Once we caught our breath and had a quick snack, the path continued gradually on steep tracks through the forest. The tracks are made of rock and dry mud and lead up to the top of the ridge. Once again we joined the old Wall, and followed it along the contours of the mountain, stopping several times to take pictures and look at the amazing rolling hills head of us. We then clambered down into the valley below, through varied terrain and in parts steep rocks, much larger than your average step. We finally got to our accommodation for the night and we bedded down in the houses of a local villager - a real cultural experience. But the food was tasty, and we again sat around the camp fire reflecting on the day’s events, laughing and sharing stories from home. We settled down for another cold night. Waving goodbye to our hospitable hosts again after a mixed night’s sleep but great company and food, we walked up through the farming terraces immediately behind the village. The path was very steep, and the terraces soon gave way to rocky hillsides scattered with scrub. The weather was already hot with blue skies, which was apparently unusual for this time of the year. Eventually we re-joined the Wall, at this point mainly unrestored and crumbling away down a cliff edge. So we followed our leader Alan along a path which took us alongside it, with fabulous views to be seen as we steadily moved up along the ridge-line. 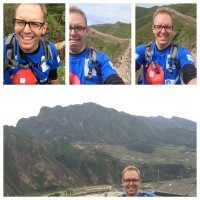 We grabbed every opportunity to take lots of pictures of the Great Wall that we could see in the distance crawling along the hillside. Finally we reached the day’s highest point where the view is difficult to describe in words, but we all took a moment to reflect on why we were there. As I took the time to catch my own breath I reflected on the British Lung Foundation and the great work they do supporting people living with lung disease, and the research that is supported alongside it. After a few group photos and a bit of mutual support (in some cases tearful), we all reflected on the realisation that, after months of fundraising, we were actually in China. And the sights that we could see were breathtaking. We then dropped down the hillside to make our way onto the winding tracks through the rough trees. On the uneven terrain, with rocks crumbling back into the valley, farmers grow maize, and walnut and fruit trees. Great friendships were being forged as we supported one another down those rocky paths. Back at the village, we walked along the long village road, enjoying the scenes of rural life with chickens running freely around. We got to the main road where we were met by a shopkeeper keen to sell us a well-earned drink. We downed these while waiting for our transport to take us on the long drive through the mountains to Jinshanlin. The journey was very scenic but also a good opportunity for a snack, checking our photos and taking a much-needed nap. Only a few hours remain to enter the most prestigious awards in the nursing profession.